Presenting You The Fastest Dodge Neon SRT4 5speed Out There! - Muscle Cars Zone! 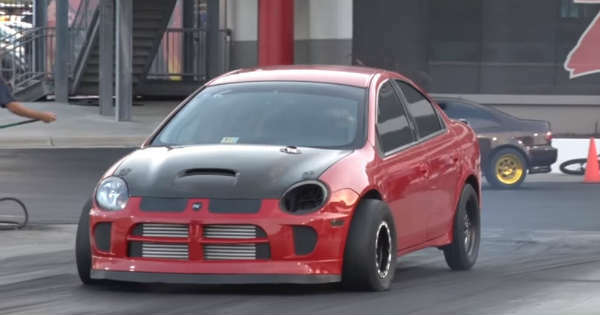 Presenting You The Fastest Dodge Neon SRT4 5speed Out There! The drag strip is one of the best places to meet some amazing people and, even better, see their amazing modifications, some of which you are going to be astonished such as this one-of-a-kind, and what can be considered as, the fastest Dodge Neon SRT4 5speed in the world. At the start of the video we see a little talk about the car itself with the owner and we take a look at how it looks under the hood. The Neon looks absolutely awesome and there is not headlight due to the fact that he had to make space to fit the turbo, which by the way, is huge. The engine is a 2.4L Turbo 16V Twin Cam with an aluminum rod. This front wheel drive car is as good as it can get and it was time to see its power on the track. During the 1st run the fastest SRT4 5speed beast manages to drive at speed of 151 MPH. After the race, the owner is asked if it can get any better and he says that he would like to go as much as 160 MPH. In the 2nd race against the VW GTI, the Neon manages to hit 158 MPH, which is surprisingly good and everyone at the track are impressed. Though at the last two races he did not manage to go as fast as this, it can still be considered as the fastest Dodge Neon SRT4 5speed out there. What do you think, can this beast be even better?